Are you one of the millions of people who is incredibly excited about the Game of Thrones season 7 finale? HBO delivered a thrilling but very quick season of the hit fantasy series this year. With only seven episodes, it absolutely soared by and that means we're going to need all of the Game of Thrones we can get. Facebook is here to help. Now, with a new filter they have unveiled, you can turn yourself into the dreaded Night King. As reported by Time, Facebook unveiled the new filter this week ahead of the Game of Thrones season 7 finale. 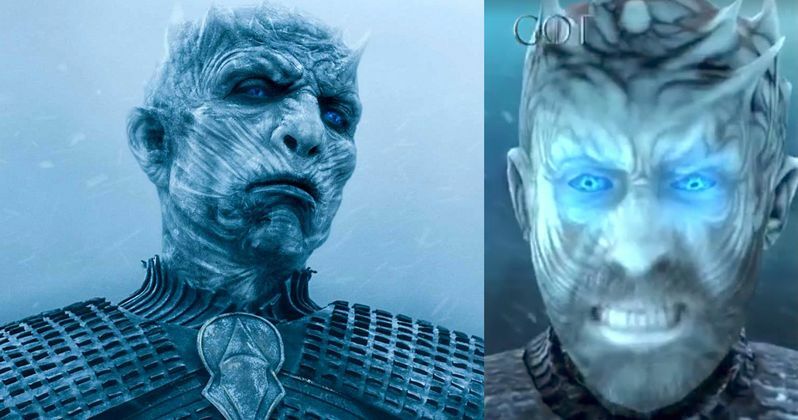 The new filter allows users of the social media site to take their profile picture, or any picture for that matter, and throw a little GoT flavor on it by transforming the photo into a version of the Night King. So if you're looking for a menacing new style, that could be the way to go. Or if you just need something to do while waiting for the new Game of Thrones episode. So how do Facebook users access this cool new Game of Thrones feature? It's pretty simple. Just tap the camera icon on the top left corner of the Facebook app. Or, you can swipe right on the news feed page and open the camera that way. From there, users can put the Night King filter to use on any photos. Might be a good time to make some pretty interesting pet photos. The Night King is one of the most menacing things on a show absolutely filled with menacing things, so this filter is going to offer up a pretty mean look. Game of Thrones has been a huge hit for HBO since the very start, but things have hit new heights this season. It is the biggest show on the planet and the audience only continues to grow. The season premiere broke ratings records and pirating numbers have been absolutely through the roof. There is an absolutely insane amount of demand for Game of Thrones this year. Since the season finales for the show have often provided HBO with the highest ratings, the season 7 finale should bring in an absolutely astonishing number of viewers. Especially since the show is nearing its conclusion. The good news is that the Game of Thrones season 7 finale is going to be an extra long episode, so that may help ease the pain of the show ending until next year's final season. Though, it probably won't ease the pain of some of the characters who are surely going to meet their demise in the upcoming finale. Maybe the Night King will get in on the action? In any case, after tonight, there is just Game of Thrones season 8 to look forward to, which will be just six episodes long. Maybe it's best not to think about the show ending. Go play with the Night King filter on Facebook instead.